"We are so STOKED about the fabulous work done by the amazing team at Brownswood Nursery! Praise God for Brownswood Nursery and their EXCELLENT team!! These men are such a pleasure to be around - kind, patient, great at answering questions, hard working, diligent, detailed & skilled yard artisans! They do a great job! They put in our entire front yard plus 3 palm trees, a flower bed and a solid fire pit with seating in over 5-6 days. Friends commented on how diligently and quickly they work as well as how lovely their work is! We have been thoroughly enjoying our install for the last month with no problems. Plus Brownswood is there for us if we have any questions. We plan to have Brownswood Nursery help us some more with a few more planting projects. They're GREAT!!!!" Our Design team will be with you every step of the way through the entire design process. We will Guide, Inspire, & Fulfill your vision for your beautiful home and property. 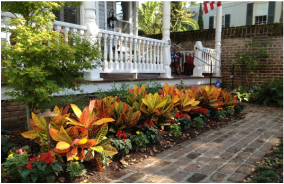 Our Landscape Division will turn your design into reality! Our experienced team is ready to serve you whether its one tree or an entire landscape transformation. Regular maintenance is the key to successfully grow your garden. Let us help you keep your garden looking its best!